Griffith, Paddy. 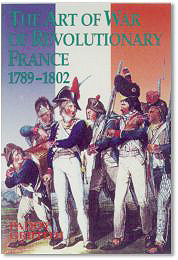 The Art of War of Revolutionary France 1789-1802. London: Greenhill, 1998. 320 pages. ISBN 1-85367-335-8. £20.00/$39.95. Hardback. Another books that is a must for the bookshelf of the serious Napoleonic scholar and enthusiast is Paddy Griffith's The Art of War of Revolutionary France. This work gives a perfect overview of the historical and military theatres of the time. It is not just about the military matters but also very much about the political and social forces that were so critical between 1789 and 1802. The book has over 300 pages, including 16 pages of illustrations, an index, and numerous tables and figures, maps, and personal comments by the author. Here too, like other Greenhill publications, an extensive bibliography is included, divided into English and works in other languages. This bibliography is such a valuable resource that it can not be adequately described here. In short, the sources in this bibliography are annotated and so extensive that hardly any source about period is left out. At the beginning of the book there's a glossary of terms and abbreviations and notes about the chronology and the dates. Included in the 26 tables are information on the economic and social situation in the different countries, military and army organizations, statistics on battles, and biographical information on key people. In addition to these tables, there are 31 diagrams that show, among other things, various military formations, maps, and political activity. Because the sources are always provided and commented upon, the reader is given the opportunity to weigh the information himself. The topics of the chapters include: the French Revolution, the politics of the time, the generals and men in the ranks, organization of the army and the navy, the weapons and tactics used, and the various battles and wars that marked the period. Doctor Griffith does a good job comparing the Revolutionary battles with those of the Napoleonic era. The book lets the reader travel through the years from 1789 till 1802 and helps him understand the intentions and ideas of the leaders, follow the men into the battles, and see how the situation in France leads to the rise of Napoleon. For those who are interested in the Napoleonic Wars this book is the perfect introduction to the events that prefaced the period. Everyone interested in either the Revolutionary or Napoleonic Wars will love this book. It is the definitive source on the subject!